This article is being posted on the 370th anniversary of a battle you may never have heard of as an excuse to write about a group you may never have heard of. But there is some value in knowing about First Battle of Newbury (fought on Sept. 20, 1643) and especially about the group known as the Levellers. While most USAmericans know quite a bit about the Civil War in the U.S., most of us don’t know much about the English Civil War, which was fought in the 1640s. One of the major battles of that war was fought at Newbury, about 60 miles west of London. That First Battle of Newbury was led by King Charles I, who ended up losing his head (literally, in Jan. 1649) in the civil war. He was the leader of the Royalist forces, but the Parliamentarian forces won the battle. Thomas Prince was on the side of the Parliamentarians in the English Civil War, and he was badly wounded at the Battle of Newbury. In the late 1640s, Prince, along with John Lilburne and Richard Overton, became a leader of a political movement that came to be known the Levellers. Stassen also explains that the Levellers group was one of the “free-church sects,” along with the Anabaptists, Baptists and Quakers, which had considerable influence on the development of democracy in England and then in New England and the other Colonies. While there is some confusion about the origin of their name, it is clear that the Levellers believed all people should be equal before the law; that is, the law should equally protect the poor and the wealthy. They were also advocates of the complete freedom of religion. Overton (1599-1664) was a Baptist during the “contentious days” of the English Civil War. According to Stassen, “He strongly advocated the human right of religious liberty on the biblical basis of following Jesus” (67-68). In 1647 Overton published the first comprehensive doctrine of human rights. But back in England he became a Baptist, and also became friends with Roger Williams, it seems. Williams left England for Boston in 1630 and founded the first Baptist church in North America later that decade. In the 1640s he was writing the same sort of thing about religious liberty in New England that Overton and the other Levelers were writing in England during that same decade. Thinking about the Levellers and their emphasis on equality and justice reminded me of this cartoon, which you may have seen on Facebook where I found it. 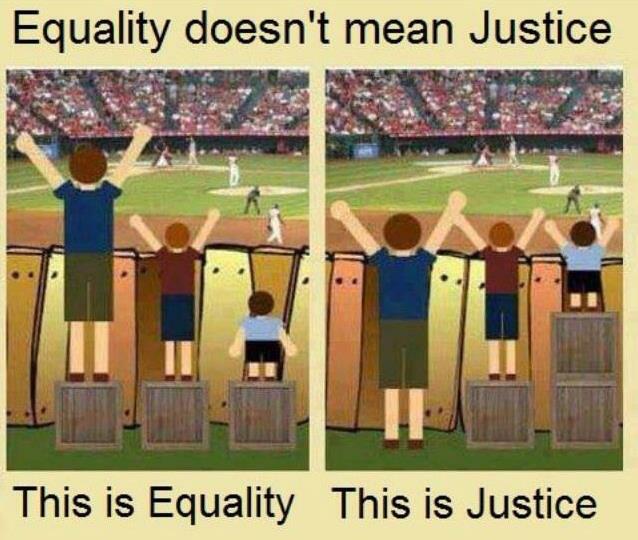 Or maybe there is not much difference between equality and justice, if you are talking about eye level rather than where one’s feet are. This entry was posted in Uncategorized and tagged equality, justice, Levellers. Bookmark the permalink.